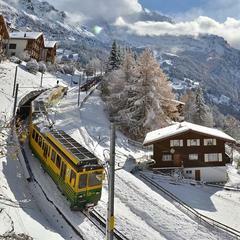 Wengen Railway is a great way of taking in the idyllic scenery. 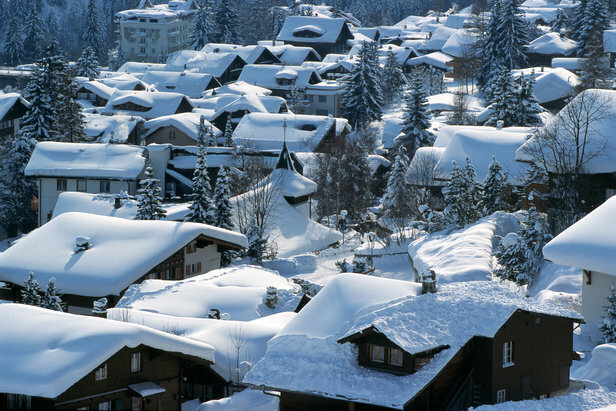 Alpine resorts are not all idyllic chocolate-box villages, often they are purpose-built concrete towns. 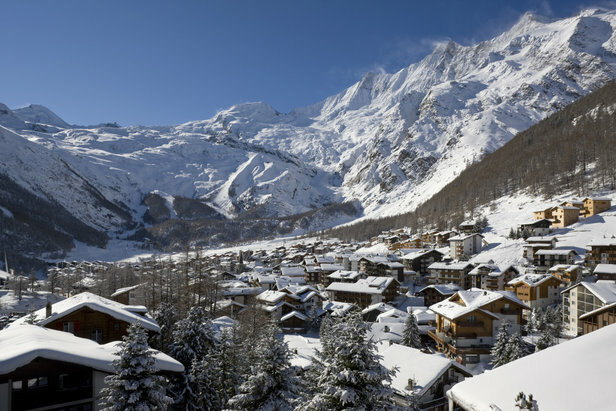 If you're after the perfect package, read our top 10 most picturesque ski resorts. 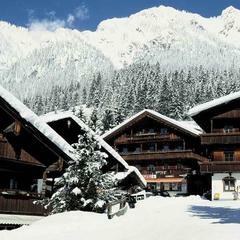 Alpbach won a televised poll in 1983 which declared it the most beautiful village in Austria . . . We know what you’re thinking – 1983? But the tag stuck and with good reason too. The village is gorgeous. Situated on a sunny plateau, 1,000m above sea level and with the Alps as a stunning backdrop, there are lots of lovely wooden chalets dotted in between a gently rising mountain. Alpbach is ideal for beginners who will find perfect flats at the base of the mountain and wide open runs in the Skiweg area. Pretty tree-lined slopes can be accessed on the main ski area. Expert skiers have a small but decent area to explore and recommended routes include those from Loderstein back to the gondola station and the runs around the Wiedersbergerhorn. 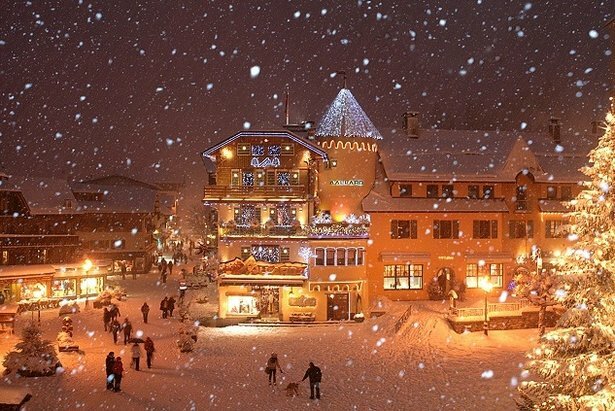 Known as "the town of the chamois", Kitzbuhel is a medieval village with cobble-stoned streets and a quaint cluster of shops and cafes – for picture perfect you can’t get much better. 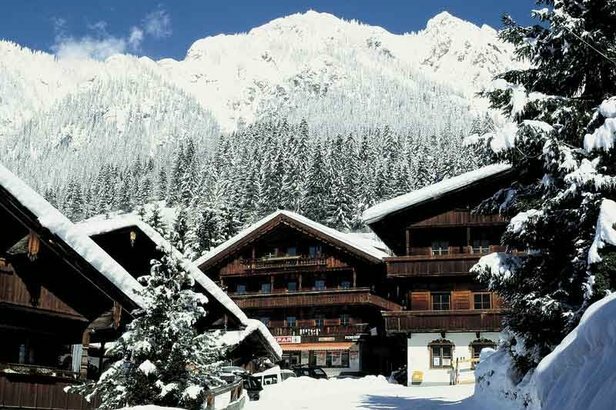 Lodging tends to be upscale and Kitz has a reputation for attracting the rich and famous but it’s possible to find average-priced apartments too. The resort draws hordes of crowds during the infamous Hahnenkamm, the terrifying World Cup downhill race, which is doused with water by race-crews to make it more perilous. It rightfully earns its reputation as one of the most challenging races in the world. It’s surprising then that the skiing caters for all abilities. The area includes the nearby villages of Kirchberg and Jochberg, as well as a separate area, the Kitzbüheler Horn. Far-reaching views from the Hahnenkammbahn in Kitzbuehel. Nestled between 13 towering peaks measuring 4000m, Pearl of the Alps Saas Fee is a gorgeous traditional Swiss village which offers spectacular Himalayan-esque views. The village centre is traffic-free with the exception of electric vehicles so noise is kept to a minimum and narrow streets are filled with boutiques, bars and cafes. The resort has managed to retain an authentic village feel and cowsheds are dotted throughout – so picturesque is it that it was chosen as the location for the music video of Last Christmas by 80s band Wham! 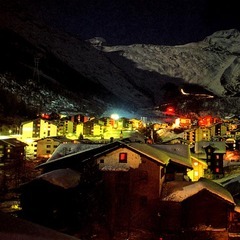 As for snow reliability, the picturesque ski resort of Saas-Fee is located at high altitude, with many of its slopes above 2500m, meaning that snow is almost guaranteed. It’s a perfect resort for beginners who can access easy slopes at the bottom, middle, and top of the mountain. Intermediates will enjoy it too but experts will find that challenging runs are lacking. Nightlife is vibrant and particularly popular is the Popcorn Bar – recipient of an MTV Bar Award. Find it inside the five-star Ferienart hotel on the main street. Perched on a mountainside above the Lauterbrunnen Valley, Wengen is an idyllic Swiss village which was actually one of the first ever purpose-built ski resorts. As such, accommodation is made up of large Victorian-era hotels and the service, as you would expect from a Swiss resort, is impeccable. 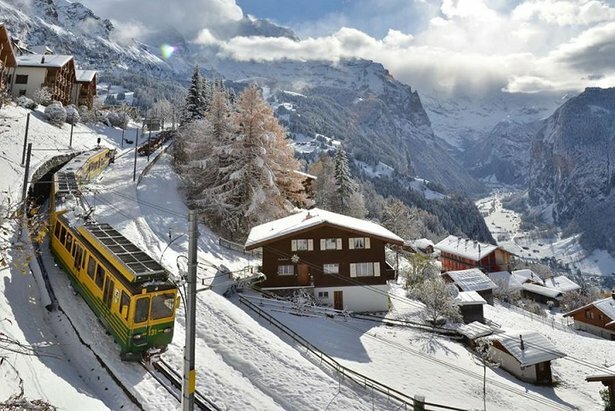 To reach Wengen visitors have to hop aboard the cog railway which feels like hopping aboard Hogwart’s Express to a magical land. The ski area is linked with neighbouring Grindelwald and the views are breathtaking; you’ll find yourself skiing beneath the impressive peaks of the Eiger, Jungfrau and Monch. The village itself is small, less than 1km in length, but it feels homely and cozy. Fashionable Megeve was developed as a ski resort in the 20s by Baroness Noémie de Rothschild who wanted to create France’s own version of St. Moritz. The resort, a medieval town at the base of Mont Blanc, became so popular that by the 50s Jean Cocteau had renamed it the "21st arrondissement de Paris". Naturally the picturesque ski resort has expanded since then but its cobbled streets and charming farmhouses have stayed the same. It is an elegant place, smart and laid-back, with a 13th-century church and open-air ice rink adorning its quaint central square. There are many excellent restaurants, several of which have Michelin stars, and many chic cafes. Shoppers are extremely well catered for with a wide selection of high-end boutiques. Après ski is smart and James Bond wouldn’t look out of place here. Located in the Veneto region of Italy, just two hours north of Venice, Cortina d’Ampezo has many virtues but its trump card is the incredible Dolomite scenery that surrounds it. Soaring dolomitic limestone that rises to over 3000m and which turns reddish-orange gives the resort a unique beauty. 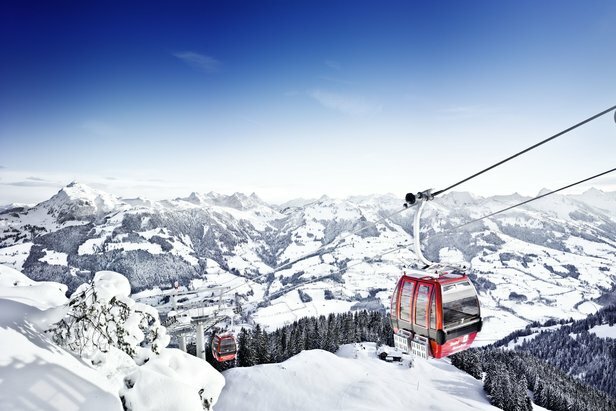 The location of the cable cars are another draw – they sit atop 100ft cliffs and attest to the fact that there is some serious skiing to be done here. 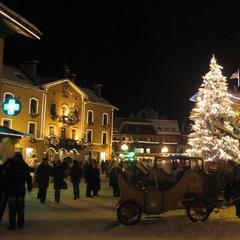 Cortina is a large village and mountain restaurants, upmarket shops and bars are all bustling. “Amazing . . . Expensive too” are phrases which often go hand in hand with Zermatt, here are a few more . . . Gorgeous, pretty, bursting with Alpine charm. Should be on every fairy-tale loving slash great skier’s wish-list; horse-drawn carriages are a regular sight. Oh, yes, and Gandalf’s hat – a real, enormous version which looms in all its pyramid-shaped glory over the mega-village. Also known as The Matterhorn. As for the skiing, there are plenty of challenging reds and a few technical blacks but for experts it’s all about Stockhorn. 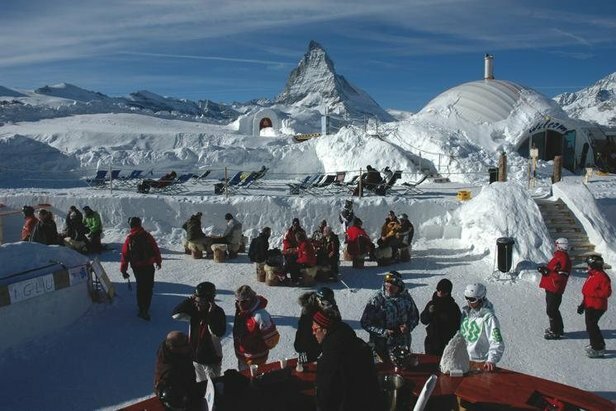 Breathtaking views of the Matterhorn from the Igloo Bar, Zermatt. Hidden away at the end of a mountain road Adelboden has been kept secret for some time now. It’s charming because farm life is still very much in evidence and come the summer your ski-instructor will probably be herding his cows. Architecture is in the style of dark wood chalet style buildings with red and green painted shutters and the square features a pretty village church with exquisite stained-glass windows. The skiing comprises five family-friendly areas totaling 210km of pistes. Snow-covered rooftops in pretty Adelboden. 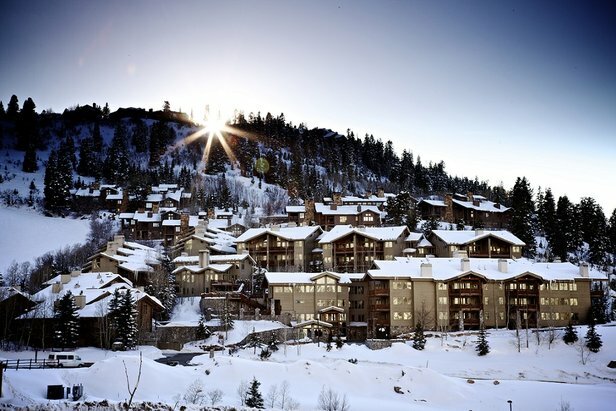 Picturesque Deer Valley has been named the top ski area in the States for five years running (Ski Magazine) which is no wonder when the terrain is as extensive as it is. There are six mountains with varied elevations ranging from 7,950ft (Bald Eagle Mountain) to 9,570ft (Empire). The snow is light and dry – the type of powder which is typical of Utah. Deer Valley won’t disappoint expert skiers who can test their mettle on three famous Olympic runs, Champion, Know You Didn't and White Owl. Food and après is upmarket and prices are dear. With a reputation for being one of the best resorts worldwide for powder, Niseko also offers spectacular views of Mount Yotei. Off-piste terrain and easily accessible backcountry is top-notch and the silver-birch trees through which you’ll ski are unique to the area. 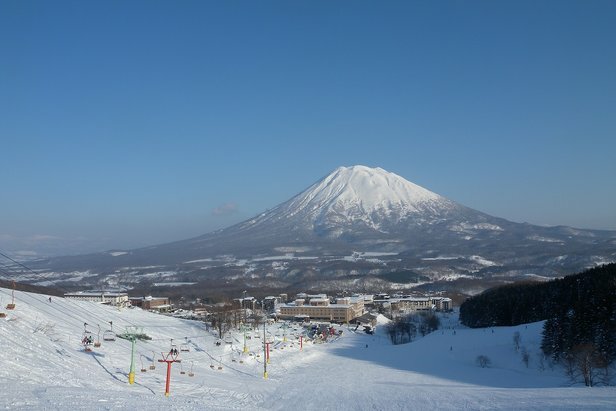 Unlike many other Japanese resorts Niseko manages to combine alpine and tree skiing. Low temperatures and low humidity work to provide that famous light and dry powder. Niseko is suited to all abilities and is particularly attractive to advanced skiers and riders. The après ski is unique too and takes place at traditional outdoor thermal baths.